Jish, Israel. 15th December, 2015. 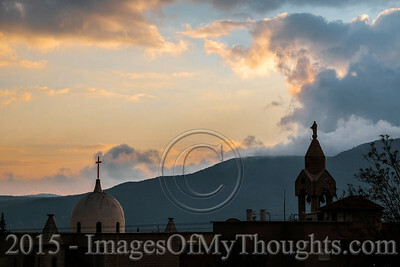 A church bell tower dominates the skyline above the village of Jish in the Upper Galilee. 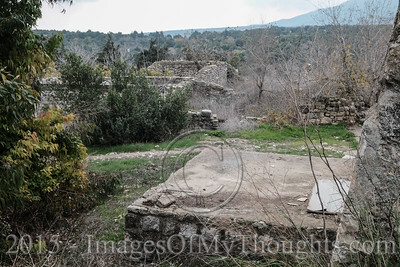 Many of the town residents are descendants of refugees from Kafr Birim. Some 1,000 Aramean Maronite Christian inhabitants were required to leave Kafr Birim for security reasons in Israel's 1948 War of Independence with an official promise to return within two weeks. Most found refuge in Jish and continue their struggle to return. Jish, Israel. 15th December, 2015. 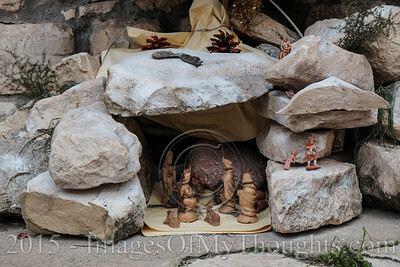 Four year old CHRISTINE sits by a statue of the Virgin Mary and baby Jesus, decorating the home of the Issa family in the village of Jish. 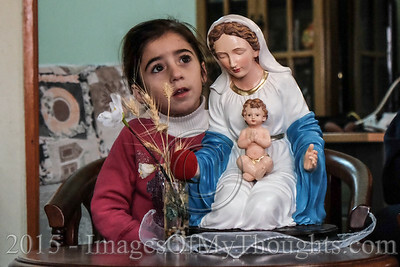 This Aramean Maronite Christian family are descendants of refugees from Kafr Birim. Some 1,000 Aramean Maronite Christian inhabitants were required to leave Kafr Birim for security reasons in Israel's 1948 War of Independence with an official promise to return within two weeks. Most found refuge in Jish and continue their struggle to return. Kafr Birim, Israel. 15th December, 2015. Rev. 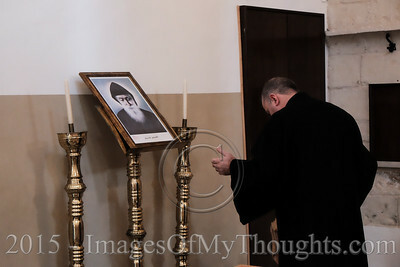 YOUSEF YACOUB prays before a portrait of St. Sharel in the Maronite Catholic Church situated in what once was Kafr Birim in the Upper Galilee. Some 1,000 Aramean Maronite Christian inhabitants were required to leave for security reasons in Israel's 1948 War of Independence with an official promise to return within two weeks. 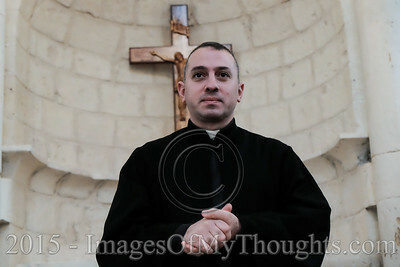 The church is the only remaining structure in Kafr Birim and remains the spiritual center of that community. Kafr Birim, Israel. 15th December, 2015. 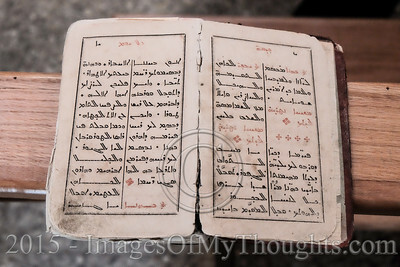 An ancient Aramaic Syriac bible is displayed in the Maronite Catholic Church situated in what once was Kafr Birim in the Upper Galilee. Some 1,000 Aramean Maronite Christian inhabitants were required to leave for security reasons in Israel's 1948 War of Independence with an official promise to return within two weeks. The church is the only remaining structure in Kafr Birim and remains the spiritual center of that community. 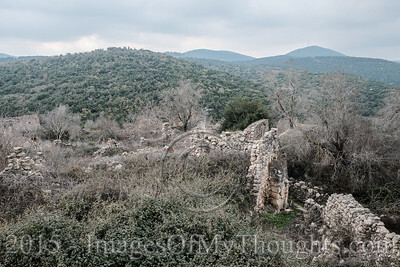 Kafr Birim, Israel. 15th December, 2015. 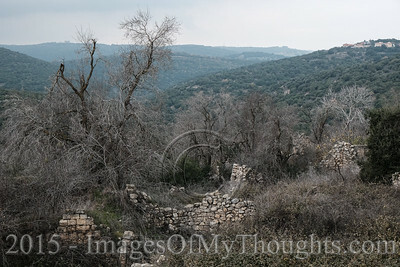 Stone ruins attest to the history of what once was Kafr Birim in the Upper Galilee. 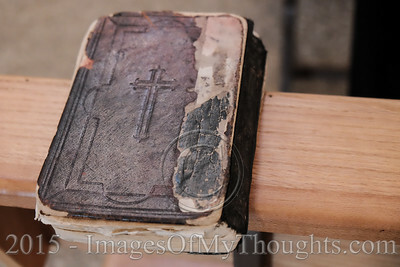 Some 1,000 Aramean Maronite Christian inhabitants were required to leave for security reasons in Israel's 1948 War of Independence with an official promise to return within two weeks. The church is the only remaining structure in Kafr Birim and remains the spiritual center of that community. Kafr Birim, Israel. 15th December, 2015. 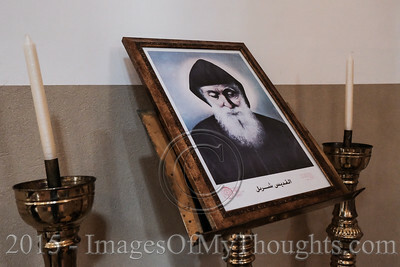 A portrait of Saint Sharel stands in the Maronite Catholic Church situated in what once was Kafr Birim in the Upper Galilee. Some 1,000 Aramean Maronite Christian inhabitants were required to leave for security reasons in Israel's 1948 War of Independence with an official promise to return within two weeks. 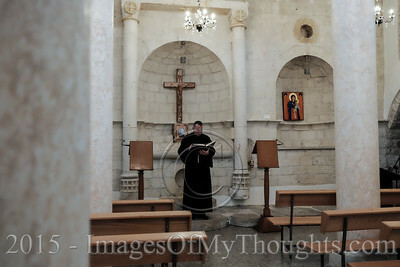 The church is the only remaining structure in Kafr Birim and remains the spiritual center of that community. Kafr Birim, Israel. 15th December, 2015. 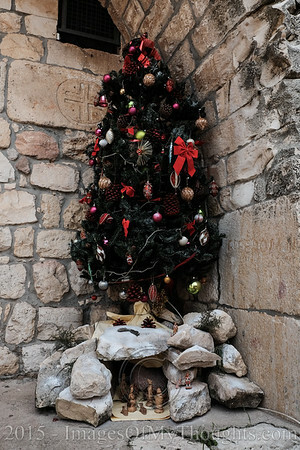 A Christmas tree stands at the entrance to the Maronite Catholic Church situated in what once was Kafr Birim in the Upper Galilee. Some 1,000 Aramean Maronite Christian inhabitants were required to leave for security reasons in Israel's 1948 War of Independence with an official promise to return within two weeks. 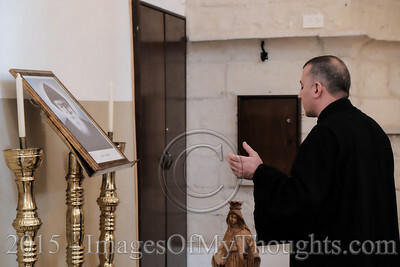 The church is the only remaining structure in Kafr Birim and remains the spiritual center of that community. Kafr Birim, Israel. 15th December, 2015. Rev. 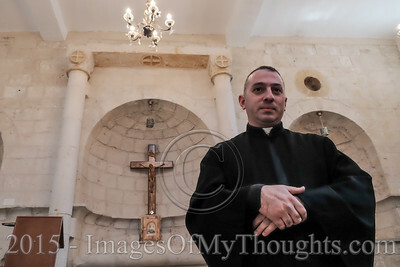 YOUSEF YACOUB stands in the Maronite Catholic Church situated in what once was Kafr Birim in the Upper Galilee. Some 1,000 Aramean Maronite Christian inhabitants were required to leave for security reasons in Israel's 1948 War of Independence with an official promise to return within two weeks. The church is the only remaining structure in Kafr Birim and remains the spiritual center of that community. Kafr Birim, Israel. 15th December, 2015. Rev. YOUSEF YACOUB argues the Kafr Birim Maronite cause in the Maronite Catholic Church situated in what once was Kafr Birim in the Upper Galilee. Some 1,000 Aramean Maronite Christian inhabitants were required to leave for security reasons in Israel's 1948 War of Independence with an official promise to return within two weeks. 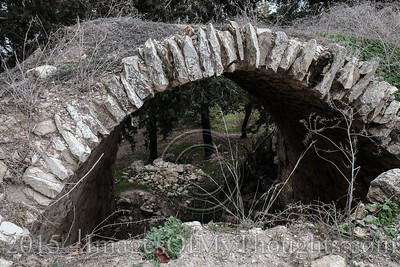 The church is the only remaining structure in Kafr Birim and remains the spiritual center of that community. Jish, Israel. 15th December, 2015. 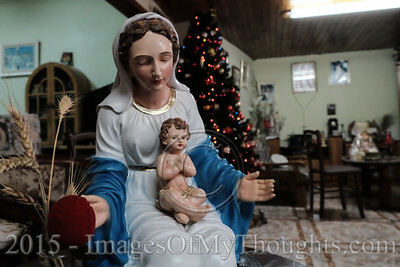 A statue of the Virgin Mary and baby Jesus decorates the home of the Issa family in the village of Jish. 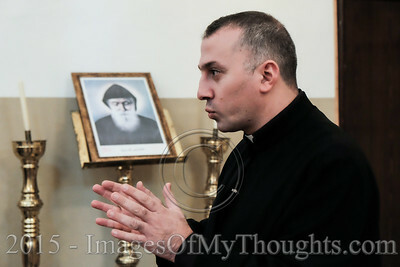 This Aramean Maronite Christian family are descendants of refugees from Kafr Birim. Some 1,000 Aramean Maronite Christian inhabitants were required to leave Kafr Birim for security reasons in Israel's 1948 War of Independence with an official promise to return within two weeks. Most found refuge in Jish and continue their struggle to return. Kafr Birim, Israel. 15th December, 2015. Rev. 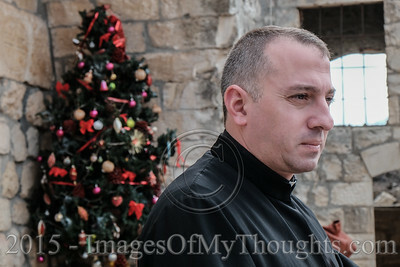 YOUSEF YACOUB stands by a Christmas tree at the entrance to the Maronite Catholic Church situated in what once was Kafr Birim in the Upper Galilee. Some 1,000 Aramean Maronite Christian inhabitants were required to leave for security reasons in Israel's 1948 War of Independence with an official promise to return within two weeks. The church is the only remaining structure in Kafr Birim and remains the spiritual center of that community. Kafr Birim, Israel. 15th December, 2015. 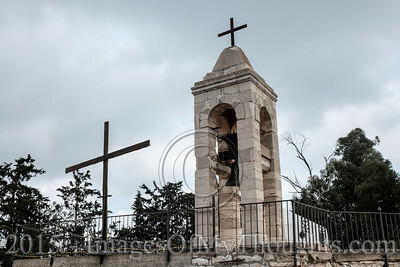 The Maronite Catholic Church situated in what once was Kafr Birim in the Upper Galilee is the only remaining structure in Kafr Birim and remains the spiritual center of that community. Some 1,000 Aramean Maronite Christian inhabitants were required to leave for security reasons in Israel's 1948 War of Independence with an official promise to return within two weeks.